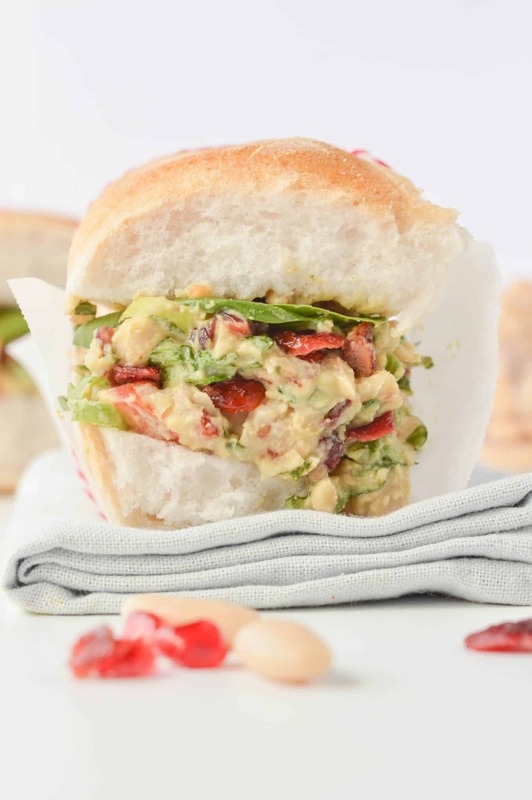 White Bean Sandwich with Cranberries, Walnuts and Basil in a creamy Tahini Mustard Dressing. An healthy vegan gluten free sandwich with Christmas colors perfect to bring on the beach for post Christmas detox lunches. I love Christmas in summer because we always go on the beach for boxing day – on 26th December. Those white bean sandwich are the best healthy sandwich to bring this year. Since we turned vegan I need new sandwich ideas for our family picnic. What I love the most about white bean sandwich is how stress-free they are! You can easily make the white bean filling few days before, bring it with you in a airtight plastic box in your bag. It perfectly spread on any bread and makes fulfilling lunch sandwich high in protein. 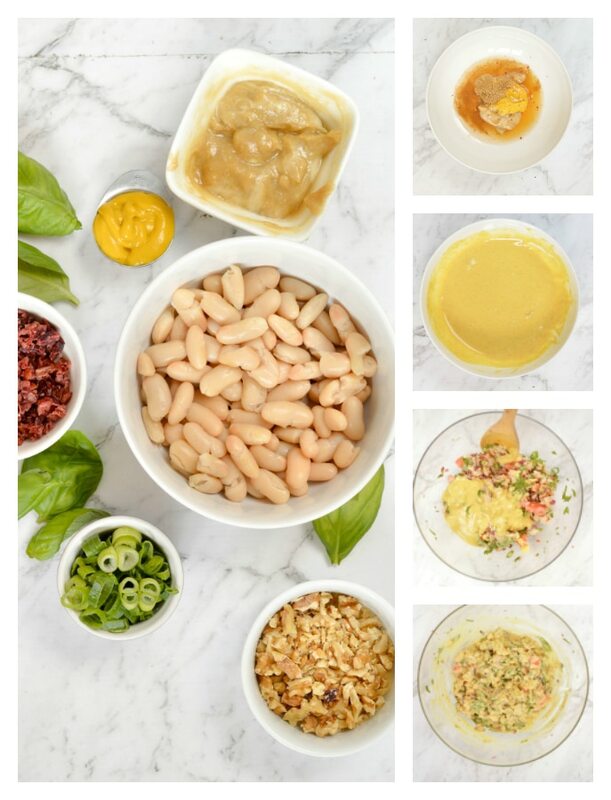 To make my delicious white bean sandwich filling you need few basics ingredients. Dijon mustard – I used American Dijon Mustard, for a stronger flavor use the French Dijon. 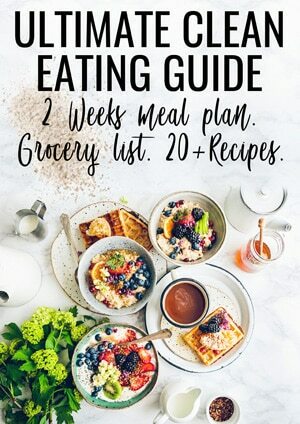 I do both and they taste amazing ! I used pull apart gluten free to make my white bean sandwich. 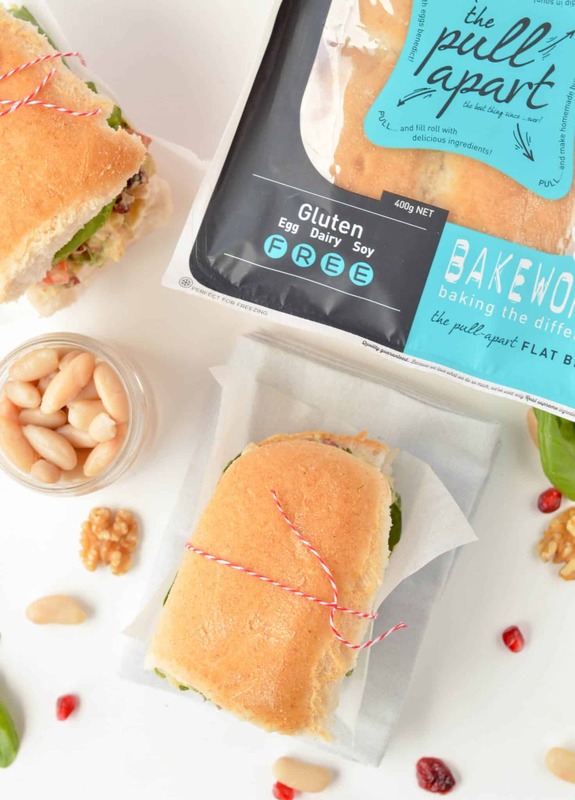 I love Bakeworks Gluten free pull apart bread for my picnics. It is an easy to share bread full of healthy flour like psyllium husk and brown rice flour. It makes delicious sandwich on the go, easy to fill and eat. The taste is absolutely amazing, light white bread for any occasion. I hope you enjoy this simple white bean sandwich recipe. If you love vegan sandwich check out my tofu banh mi vietnamese baguette, it is also one of my family favorite. Watch the White Bean Recipe Video and see how easy they are to make ! 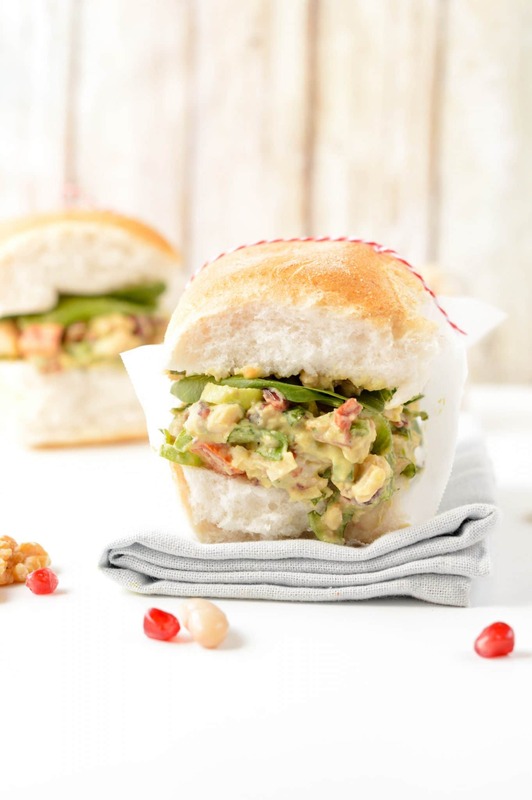 White Bean Sandwich with Cranberries, Walnuts and Scallions. 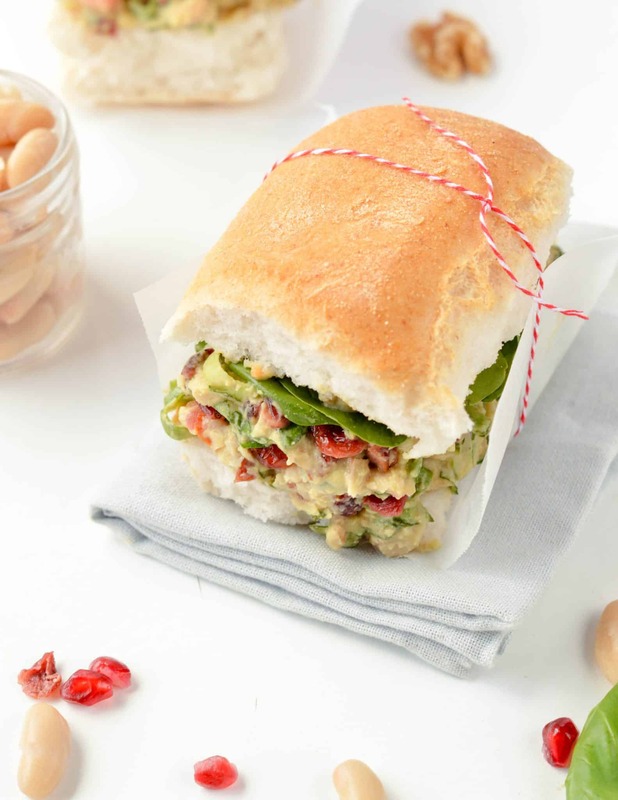 White Bean Sandwich with Cranberries, Walnuts and Scallions. An healthy vegan gluten free sandwich with Christmas colors perfect to bring on the beach for post Christmas detox lunches. 1/4 cup walnuts , roughly chopped, toasted if you have got time ! In a small mixing bowl whisk the tahini, apple cider vinegar, maple syrup, water and ground cumin. Set aside in the fridge while you prepare the white bean filling. In another bowl, mash the white beans roughly with a fork or potato masher. Add in cubed tomato, scallions, cranberries, walnuts, fresh chopped basil, salt and chili flakes if you like some spice! Stir in the tahini mustard dressing. Refrigerate one hour to blend the flavor or fill directly into sandwich and refrigerate the sandwich an hour. To serve, spread extra Dijon Mustard on both part of the bread. On the bottom sandwich part, add fresh basil leaves, baby spinach leaves then spread the white bean filling, more basil leaves and spinach. Close and enjoy ! Vinegar: I used unfiltered apple cider vinegar but any vinegar will work too or lemon juice. Make ahead/store: you can make ahead the sandwich filling and store in an airtight plastic container in the fridge. It store perfectly for up to 3 days. Spread in your favorite sandwich bread when needed. I also stored the prepared sandwich 24 hour in the fridge wrapped in plastic sandwich wrap. I’m sorry, can’t seem to find the avocado anywhere in the recipe. It says to store the sandwich filling for three days but after that the avocado will turn brown. Do you add the avocado to the filling and how much? I am not sure why you are asking for avocado. I never mention it in this post or recipe. The creamy texture you see is 100% from mashed white beans. Enjoy ! XOXO Carine. Hello ! SO sorry for confusing you my friend 🙂 I did had some avo in MY own sandwich haha I didn’t in the original recipe but I must tell, I am adding avocado EVERYWHERE. It is summer in NZ and it is the avocado season, they are huge, creamy so it is very tempting. That must be why I added a note about how it gets browns after 3 days in the fridge and another reason why I did share this recipe with it. I updated the note to be clear. Thanks for correcting me and reading the blog. Love from NZ, Carine. I made this today for lunch with some tweaks. I couldn’t find basil so I used spinach leaves instead and in the tahini mustard, I didn’t include the water because I wanted a thicker sauce. It was amazing…Definitely recommended! Amazing recipie. I added avocado and skipped the cranberries, instead adding a little pile of caramelised red onions on top. Mmmm. OMG, caramelised red onions is such a great idea! I bet it was super tasty. Another new option to try in my next sandwich. Thanks for sharing ! XOXO Carine.